Various calculations of the amount of the heritability of colorectal cancer explained according to 1) Lichtenstein et al., 2) Czene et al., and 3) Jiao et al. *All estimates are in the liability scale. While lifestyle and environmental exposures play an important role, a sizable fraction of colorectal cancer is expected to be explained by heritable factors. Several twin and family studies have estimated this heritability to be on the order of 12 to 35%. Genome-wide association studies have successfully identified several common genetic variants that contribute to colorectal cancer risk. However, it is not known how many common genetic variants remain to be discovered. In a recent study published in Human Molecular Genetics, Drs. Shuo Jiao, Li Hsu, and colleagues in the Public Health Sciences Division, used several statistical approaches to report that currently identified variants represent only a small portion of the expected heritability of colorectal cancer. This suggests that many common variants associated with colorectal cancer risk remain to be detected, and that rare variants, gene-by-gene and gene-by-environment interactions are likely to play a large role as well. To estimate the heritability of colorectal cancer, the authors utilized data from 10 studies participating in the Genetics and Epidemiology of Colorectal Cancer Consortium (GECCO). The availability of the roughly 20,000 cases and controls in GECCO was key to this analysis, said lead author Jiao, as "the large number of variants genotyped (approximately 500,000), combined with their modest effect, makes sample size an important factor for estimating the heritability of colorectal cancer." The authors used this data to perform a Genome-wide Complex Trait Analysis (GCTA). This method utilizes all the single nucleotide polymorphisms (SNPs) that were genotyped, not just those passing stringent statistical significance thresholds, to calculate the heritability of colorectal cancer. The benefit of this method is that there may be many variants with weak effect sizes for colorectal cancer risk that do not pass these stringent statistical thresholds but collectively still contribute to the heritability of the disease. By using the GCTA method, the authors estimated the amount of heritibility explained by known CRC susceptibility loci, as well as all common SNPs across the genome. First, they found that the heritability explained by the 31 SNPs previously associated with colorectal cancer was 0.65%. Since fine-mapping approaches have found potential secondary independent signals in such regions, a second analysis was expanded to include all SNPs within 250,000 base pairs of the known loci, which increased the estimated heritability to 1.14%. Finally, an analysis incorporating all common SNPs genome-wide (those with ≥ 1% minor allele frequency) provided a heritability estimate of 7.42%. Said Jiao, "these results suggest that known colorectal cancer SNPs only explain a small proportion of the heritability, and that additional common SNPs have yet to be identified." The authors also examined the proportion of variance explained by gene-environment interactions for various environmental factors, the strongest of which was for an interaction with smoking status at 6.94%. Though requiring replication, this suggests that gene-environment interactions may contribute a sizable fraction of colorectal cancer variability. Overall, said Jiao, "this study quantifies, for the first time, the fraction of heritability of colorectal cancer that was explained by common GWAS SNPs." This provides an example of the success achieved by GWAS studies, and suggests that future studies should be successful at identifying additional variants. Said Jiao, "the next steps would be to find out the heritability of colorectal cancer explained by less common and rare variants and also common variants that have not been genotyped." To this end, the authors are working to develop novel methods for estimating heritability. Combined with the results from the present study, said Jiao, "these should provide useful guidance to whole genome sequencing studies." Other PHS investigators contributing to this project were Drs. Ulrike Peters, Christopher Carlson, Jian Gong, John Potter, and Emily White. Also contributing from PHS were Tabitha Harrison and Keith Curtis. Lichtenstein P, Holm NV, Verkasalo PK, Iliadou A, Kaprio J, Koskenvuo M, Pukkala E, Skytthe A, Hemminki K. 2000. 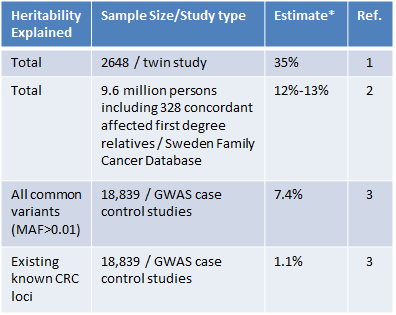 Environmental and heritable factors in the causation of cancer--analyses of cohorts of twins from Sweden, Denmark, and Finland. N Engl J Med 13;343(2):78-85. Czene K, Lichtenstein P, Hemminki K. 2002. Environmental and heritable causes of cancer among 9.6 million individuals in the Swedish Family-Cancer Database. Int J Cancer 10;99(2):260-6.